Log cabins at Grand Mountain are some of the popular accommodations of Thousand Hillls Resort in Branson which are beautifully nestled in a rustic and majestic wooded setting around the Ozark mountains. These Thousand Hills log cabins offer luxury and comfortable lodging and provide a great ambiance for the whole family. These cabin rentals offer guests a wonderful stay where they get to enjoy its great amenities that include modern furnishings and stunning wildlife scenery. The interiors of log cabins are designed individually to capture the image of the natural landscape. 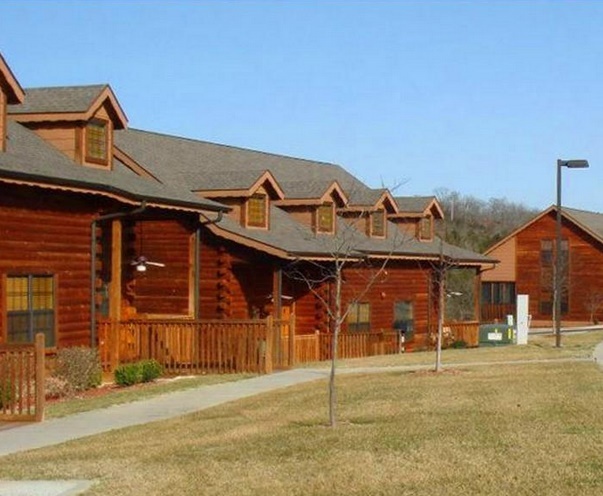 The convenient location of the log cabins is just minutes away from the heart of Branson. Thousand Hills log cabins feature unspoiled nature, pristine scenery, clean and crystal clear waters of the lake, and spectacular lakeside attractions. These great accommodations in the secluded place offer visitors luxurious and comfortable living that cannot be enjoyed anywhere else in Branson. The fascinating location of this vacation getaway that is surrounded by natural beauty of the mountains gives visitors the opportunity to experience good old Ozarks hospitality. As the place is near the Thousand Hills Golf Course, you can get the chance to play with its most popular 18-hole golf course. The convenient location of log cabins in Branson and its affordability are some of the reasons why many guests fall in love with it and come again. Thousand Hills Golf Resort has been recognized for many years as one of the leaders in luxury cabin accommodations offering nightly rental programs. Log cabin accommodation which hasn’t been known for many years became popular after many clients testified the excellent services they have received. Luxury log cabins feature the best package that includes many modern amenities and a beautiful view of the wildlife scenery enjoyed from the deck of each log cabin. Each year, millions of visitors flock to Branson to see the natural beauty of the surroundings that will give you the chance to hear the tweets of birds on trees and bubbling of the streams. Many people who haven’t stayed yet in log cabin in Thousand Hills think that it will not give comfort and convenience. Not so with Thousand Hills log cabins as it feature beautiful designs with high-end amenities that include free wireless internet connection, cable TV with HBO, DVD player, Jacuzzi tubs, and rain showers. The cabins also feature screened porch allowing guests to view the stunning scenery around the place. The kitchen of each log cabin is fully furnished with modern appliances such as refrigerator, microwave oven, washer and dryer, pots and pans, dishes, and other kitchen wares and utensils. The luxurious and comfortable type of log cabin accommodations of Thousand Hills can help make many people decide to book a wonderful stay in a rustic and cozy place that is beautifully located around the picturesque foothills of the Ozark Mountain. For smart tourists planning to spend a wonderful vacation in Branson, should make a smart choice and stay at the log cabin accommodation of Thousand Hills Golf Resort.